Who would've thought that back in 2011 Little Mix would end up winning X Factor, let alone releasing one of the best pop efforts of 2013? The girls' debut, 'DNA', played things safe by largely imitating previous girl bands - both in sound and lyrical content. 'Salute' is a continuation of their 90s R&B sound and lyrics of female empowerment (taking a cue predominantly from Destiny's Child) but is a far more confident and assured effort. This is basically the Beyoncé album that we've been craving all year. The opening title track immediately establishes the militaristic style that's maintained throughout the album - all snare beats, trumpets and lyrics acting as a call to arms for independent women ("warriors, your country needs you"). Final track A Different Beat is a suitable mirror image, though it's a bit more High School Musical than Lose My Breath. That said, the girls have far more sass, attitude and personality than ever before, as epitomised by lead single Move with its tongue clacking beat and empowering lyrics. Nothing Feels Like You isn't quite Beyoncé's End Of Time but it's pretty close, pairing its anthemic chorus vocals with deep, modern production, whilst Competition is full of girl power. It's Boy that truly shows how far the girls have come, however, beginning with an a capella opening that's pure Destiny's Child. Where the up-tempo songs showcase some solid harmony singing, the ballads proves the girls are just as strong individually - it's not all about Perrie, with each girl proving her worth. Towers, These Four Walls and Good Enough are all big slushy ballads suitable for any X Factor winner, but the latter especially features some beautifully fragile singing and apologetic lyrics that make a nice contrast to the hard edge of the rest of the album. And although Little Me is a little saccharine ("wish I could somehow go back in time and maybe listen to my own advice, I'd tell her...she's beautiful, wonderful, everything she doesn't see"), it's saved by its melody taken from Faurés Pavane. The direct lyrics of each track will certainly appeal to the target demographic, whilst the production will perk up the ears of older listeners. 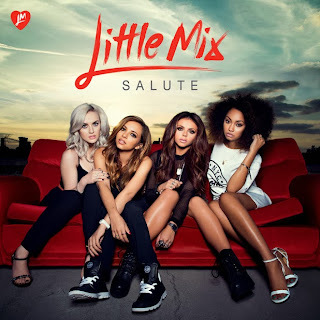 The girls should also be commended for their involvement in the songwriting. 'Salute' might not be the most original album around, but their newfound confidence proves why Little Mix really are the UK's premiere girlband. Listen: 'Salute' is available now.